Agile software development is a conceptual framework for software engineering that promotes development iterations throughout the life-cycle of the project. There are many agile development methods; most minimize risk by developing software in short amounts of time. Software developed during one unit of time is referred to as an iteration, which may last from one to four weeks. Each iteration is an entire software project: including planning, requirements analysis, design, coding, testing, and documentation. An iteration may not add enough functionality to warrant releasing the product to market but the goal is to have an available release (without bugs) at the end of each iteration. At the end of each iteration, the team re-evaluates project priorities. 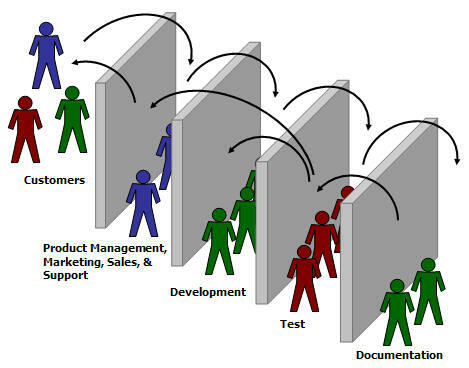 Agile methods emphasize face-to-face communication over written documents. Most agile teams are located in a single open office sometimes referred to as a bullpen. At a minimum, this includes programmers and their "customers" (customers define the product; they may be product managers, business analysts, or the clients). The office may include testers, interaction designers, technical writers, and managers. Agile methods also emphasize working software as the primary measure of progress. Combined with the preference for face-to-face communication, agile methods produce very little written documentation relative to other methods. This has resulted in criticism of agile methods as being undisciplined. Agile development, in its simplest form, offers a lightweight framework for helping teams, given a constantly evolving functional and technical landscape, maintain a focus on the rapid delivery of business value (i.e., “bang for the buck”). As a result of this focus and its associated benefits, organizations are capable of significantly reducing the overall risk associated with software development.